Today I have a secret recipe for one of my favorite comfort foods served at KFC. 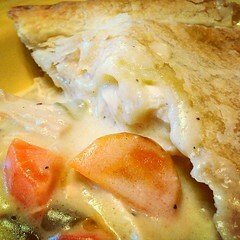 A delicious chicken pot pie always brings me back to my childhood. Some time saving tips for this recipe is to pick up a rotisserie chicken and pre-made pastry dough from the supermarket. Measure out all of your ingredients. Sift together your salt and flour. Make a well in the pasta. Place butter in small knobs all of the way around the dough. Pour water and egg in the well. Start to incorporate the flour. Use a bench scraper or a pastry fork to fold in the flour. Or you can combine all of these ingredients into a food processor, and process until a soft dough is made. Make the filling, by first by placing the cut carrots, and the potatoes into a small pot, covering with water. Cook over medium heat for about 8 to 10 minutes or until the vegetables are just tender. In a medium sized pot combine the cans of chicken soup mix, and milk. Heat through, and stir until the soup is heated through. Add cooked chicken, carrots, potatoes, frozen peas. Fill each pie plate with about 1 cup of filling. Roll out dough, and drape over the pie plate edge. With a knife gently cut a slit into the pie dough, so steam will escape. Bake for about 20 – 25 minutes or until the tops are just turning golden brown. Today I have a secret recipe for one of the latest dishes served at KFC. The Colonel’s latest creation was inspired by one of Nashville’s most famous dishes. The Nashville hot chicken features a perfect blend of spicy cayenne and smoked paprika. If you enjoy chicken with a nice kick, then this dish is for you. Toss the chicken with black pepper and 2 tablespoon salt in a large bowl. Cover and chill at least 3 hours. Whisk the eggs, buttermilk, and hot sauce in a large bowl. Whisk flour and remaining 4 teaspoons salt in another large bowl. Fit a Dutch oven with a thermometer; pour in oil to measure 2 inches. Heat over medium-high heat until thermometer registers 325 degrees. Pat the chicken dry. Working with 1 piece at a time, dredge in flour mixture, shaking off excess, then dip in buttermilk mixture, letting excess drip back into bowl. Dredge again in flour mixture and place on a baking sheet. Working in 4 batches and returning oil to 325 degrees between batches, fry chicken, turning occasionally, until skin is deep golden brown and crisp and an instant-read thermometer inserted into thickest part of pieces registers 160 degrees for white meat and 165 degrees for dark, 15 to 18 minutes. Transfer to a clean wire rack set inside a baking sheet. Let oil cool slightly. Whisk the cayenne, brown sugar, chili powder, garlic powder, and paprika in a medium bowl; carefully whisk in 1 cup frying oil. Brush the fried chicken with the spicy oil. Serve with bread and pickles.